Christ died for you. You are loved, and you are His son or daughter (1 John 3:1). He has empowered you with His Spirit to be His witness (Acts 1:8). He will work in you and through you as He works all things together for good and conforms you to the likeness of Christ (Romans 8:28–29). He is with you always, even to the end of the age (Matthew 28). This foundational truth is not simply the message to share with those you lead, but it is the message that frees you in your distraction, discouragement, and disillusionment. The gospel is liberating for pastors because it shifts the benchmark of success from building something to becoming something—from saving something to being saved by someone. The gospel brings joy to pastors and church leaders. The reality is, most of us, even as pastors, function as deists: God exists, but He is distant and absent in caring for us and coming to our rescue—and this life is all there is. As pastors, we add, “Unless I come to the rescue and help and healing of all those around us.” We are on our own to repair our broken world. God, we falsely believe, delegates the task of healing the world to us, and He is counting on us. If things really get messy, maybe He will “show up” in a powerful way. This is one of the foundational assumptions of our culture; we can fix it. This sends us as pastors and leaders, who are predisposed to service, into the world not only to secure our own comfort, acceptance, significance, and satisfaction through our own means or by using other people, but also to secure wholeness for everyone else in our lives. Though we might shout, scream, and hope for someone else to make us whole, shape our lives, and make us what we long to be, we don’t believe anyone can or will. If God isn’t there to save us, He won’t save others. Therefore, we settle for lesser ambitions. Instead of hoping for full restoration and vibrant lives in ourselves and those around us, we hope for a distracted life. We hope to dazzle those around us enough so they don’t see us behind the curtain, pulling the strings and weeping in our brokenness. We hope for pain relief in those around us instead of healing. Even as we preach about a savior, we doubt He could save us. Your goal is to work hard enough to hold off the evils of the world and win small battles within your congregation. God defeated sin, evil, and death for us. God took on pain, suffering, and death. God is victorious in life. God loves us and comes to us. This means we no longer struggle to make ourselves right and justify our actions before ourselves, others, or God. Instead we find our justification in Him. Instead of trying to find something worthy of our worship in this world, we worship the God who saves and brings life out of death. Instead of fearing death, we behold life. Instead of securing comfort, we run to our comforter. Instead of striving, we find rest in God. The gospel changes everything we believe and therefore how we live. The calling is to give up our identity to find our identity in Christ. This is incredibly true for all followers of Jesus. It is especially true for pastors, equippers, and coaches. God, in Christ, has caused us to be born again, to a living hope, as heirs to a certain salvation. The gospel doesn’t simply transform our minds and hearts in our belief; the gospel changes who we are. The gospel is personal. The historically rooted, world-changing news of Jesus makes you new. This is not just good news for the people you lead; it is good news for you. The Scriptures describe a transformation from orphan to son of God. We are adopted into the family of God by God’s grace. Though we were once alone and estranged from our Father in heaven, God relentlessly sought to bring you back into the family. The New Testament calls believers in Jesus heirs—sons and daughters of God, brothers and sisters in Christ. No longer do we live as orphans in this world left to control, manipulate, and grasp for security amidst chaos. We now receive the blessing and position of being God’s beloved. As a leader of leaders, it is easy to imagine yourself on top of an organizational chart and as a member of an exclusive club with many unique challenges. The truth, however, is you are a son or daughter of a good Father who includes you in His work. Your unique challenge is to be satisfied in being His son and finding your place at His side while leading others. You no longer strive to find new people to please or new ways to please old masters. Your Father has given you every spiritual blessing—namely, His presence. The New Testament is also straight-forward in the transformation from slave of sin to liberated friend of God. The gospel is the message that we have now been purchased, ransomed, and liberated from the power of sin by Christ’s death and resurrection. The gospel liberates us from the identity of slave in this world to free-man. Sitting around the table with His disciples as He prepared for His death, He speaks eloquently to those who have followed His ministry most closely: “I no longer call you servants; I now call you friends.” Jesus came to establish friendship between us and God. His death is the way for us to be reconciled and freed to be unified with Christ. How many of us long to do work for God without knowing God? We imagine Jesus as a task-master, calling shots and demanding a better and more successful church. However, Jesus looks at us and calls us liberated friends, no longer bound to the power of sin in our lives. We are friends united with Christ. The gospel frees us from finding our identity in our ministry success or becoming a slave to the lies spoken about our worthiness. On the contrary, our identity is rooted in our relationship with Christ and His work to restore us. Our identity is transformed from refugee to citizen of the kingdom of God. We were once of the kingdom of darkness, alienated and estranged from God. Now we have been transferred into the kingdom of glorious light. No longer do we scavenge for a place in this world. No longer are we resigned to being our own king. Instead, we have found our home in Jesus our King, and our lives are shaped by life in His kingdom of compassion, grace, forgiveness, love, and hope. As a leader, you are free to take your place as a participant in His kingdom and give up the stress of maintaining your kingdom. As you shepherd, care for, equip, and disciple others, you aren’t building a name for yourself but are pointing people to a life defined by the name above all names. This empowers you to look into the depths of a church’s darkest hours, knowing Christ rules over every power and authority, and His kingdom will not fail, even if your church closes its doors. When our motivation for leading leaders comes from a desire to see people remember who God redeemed them to be, we don’t control them. When our desires are rooted, as Paul describes, “being complete in Christ,” we are able to pursue Christ while we lead. When we realize the gospel transforms people, we behold the beauty of Christ and not the glamour of models. We trust God. We belong to God. We are His beloved. The gospel makes the world new. This is typically where we get excited as pastors who aim to lead their churches into effective disciple making communities. We envision a church that receives the gospel and goes into the world transform it. We see our communities as relevant and sacrificial people, making great culture, redeeming social ills, and sharing the whole gospel. Our sights are set on seeing people in our churches as the most creative, neighborly, and compassionate people in our cities. 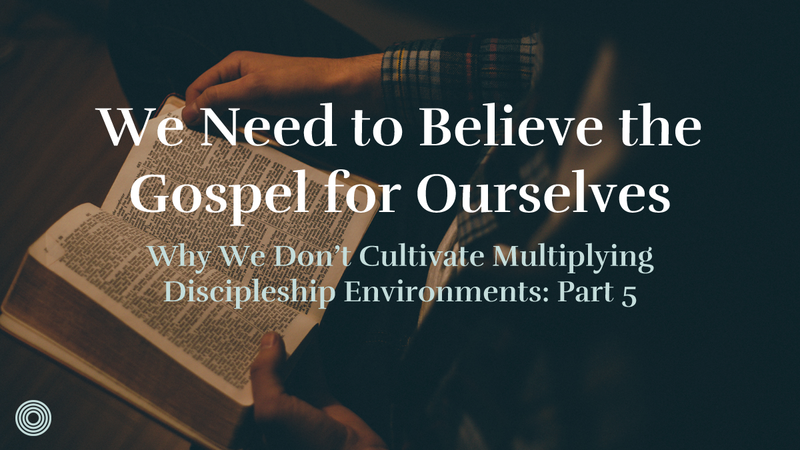 Often we believe we are crucial to the hope of our churches, cities, and nations. We are the change we want to see in the world or some iteration of Ghandi’s famous quote. In seminary you may have been taught that nothing will happen without your example, attention to detail, or drive to move the mission forward. We live like we can and do change the world. Thankfully we’re wrong. Jesus changes the communities where we live. The gospel is the good news that Jesus changes the world. The gospel is the hopeful announcement that God is making all things new in Christ Jesus! The gospel ushers us into a new kingdom and new world. We no longer live in a world dominated by death and deconstruction but in a world of resurrection and recreation! For the pastor, missionary, and “leader of leaders,” this is double good news. Not only is the message good news to our neighbors, the poor, our city, and the world, Jesus is the one proclaiming it! He affects the social, cultural, and physical fabric of the universe. In Luke 4, Jesus preached the gospel to the poor, marginalized, and oppressed. It is good news for them because through His death and resurrection He has defeated sin, death, and evil (1 John 2:13; 3:8). The gospel announces the in-breaking reign of Jesus, which is in the process of reversing the order of things. The poor become rich, the captives are freed, and the old become new. This means two things for us. One, we are participants and servants in His kingdom come, not the kings. Two, Jesus advances the mission, not us. We don’t have to look to our surroundings, circumstances, or even the quality of the missional communities we lead to trust His kingdom is advancing. The invitation posed to us is to step into His kingdom, to believe the gospel, and to serve Jesus the Servant-King. The gospel makes disciples, cultivates discipleship environments, builds the church, and cares for the hearts of leaders like you and me. The gospel locates leaders in a peculiar place: the table of God as His guests. It’s hard to be distracted at His table. It’s impossible to remain exhausted as His guest. The truth shines brightest as He breaks the bread and pours the wine. 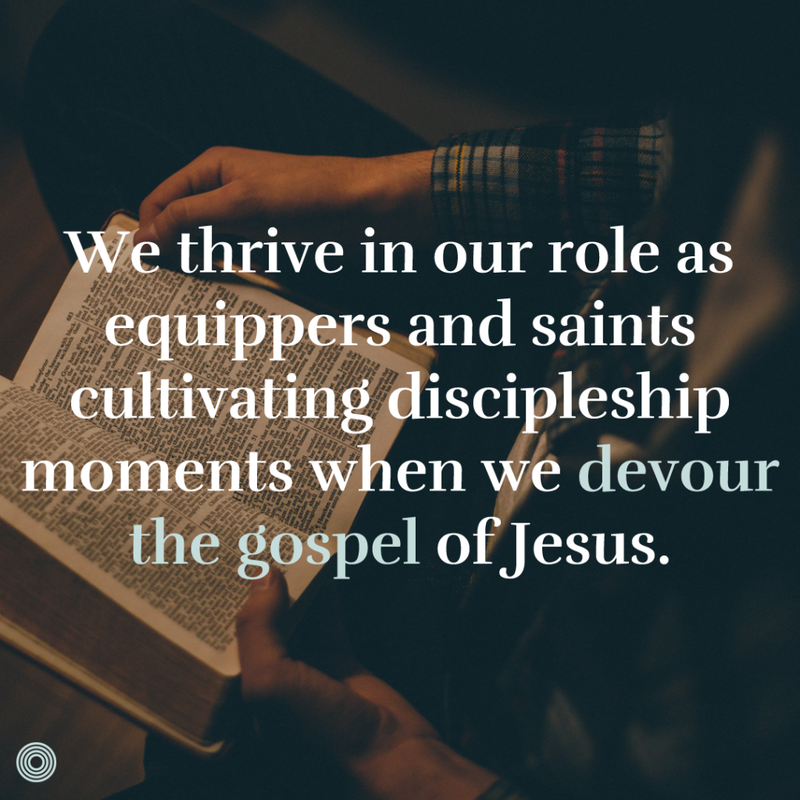 We thrive in our role as equippers and saints cultivating discipleship moments when we devour the gospel of Jesus. I love this definition of the gospel from Jonathan Dodson. What is God saying to you as you read? Who is God saying you are? What is the Spirit swelling up within you?